How can I become a supporter of this great project? Although I’m from Germany, I enjoyed some time in Rockin’ S.A. in 1987, listening to (and taping!) Joe Anthony’s show on 99.5 KISS, and I’m still loving it. Just dug out my old tapes, and after listening to them again and again, I’d really like to contribute to this great project. So, if there’s a possibility to donate or anything else, just contact me, I’d me more than happy and proud to help you out in any way. Rock n roll will always be n live in San Antonio hearts. Thanks to joe Anthony. During normal business hours, the administrative employees were there to handle contest winners etc. But after hours, the doors were always unlocked with no security whatsoever. Either Joe Anthony, Lou Roney or Donnie Mills would be there. I have a few stories from the early days at 1100 N Main. I’ll never forget the words “KMAC” in all cap wooden letters on the left one of the double doors, and “KISS” on the right door, that led directly to the broadcast studio. One evening I snuck up the Godfather as he was introducing the next album. He was very startled once he turned and realized someone was just standing there. I didn’t want to interrupt him while on the air, ya know? We got a good laugh from it. He showed me pictures of the Runaways who has performed at Randy’s Rodeo recently. I had won an autographed album, the first from Starz. I still have it. It was also signed “Rock on, it’s reel with KMAC and KISS”. I have a few other prizes and many memories. Lots of concert tickets stubs, as well. They would take the time to talk to me for hours on the phone. It was very cool. I was 13/14 in 1976 when all that began for me. Joe Anthony was the best thing for music in San Antone… Remember that? “Rock and roll San Antone” has everyone forgotten that was, in my opinion, his most famous quote. This is a wonderful project. 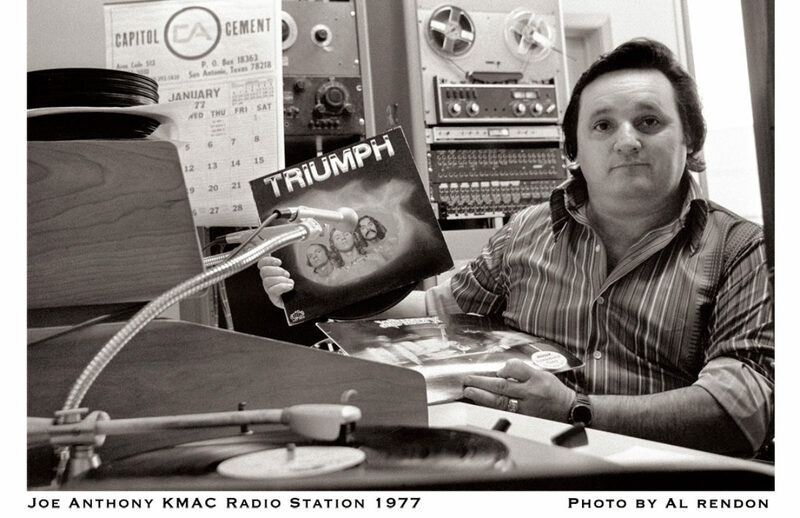 I grew up in the sixties and seventies and I fondly remember tuning in to KMAC during the early days since it came on AM radio. I was a teenager then and radio surfing and came across Joe Anthony playing the full side of Pink Floyd’s Echoes from the Meddle album. Later on in life when I joined the military and was stationed in Incirlik, Turkey, my wife would ship albums of Triumph, Riot, Moxy, Budgie, Riot, Saxon, Yesterday and Today, Rush, etc., and my friends asked where I got all that good rock and I proudly stated that San Antonio is known as the heavy metal capital of the world due to a certain DJ named Joe Anthony. They were simply amazed and we rocked Turkey loud and proud. I still have some of those albums. Long live the GODFATHER!